This article describes the physical characteristics of magnetic circuits and gives a summary of elementary calculations about magnetic systems. They can be used to convert magnetic parameters from measurements. The physical characteristics are very important when doing calculations on magnetic circuits. Essentially are the cross-sectional area of the core Ac, and the magnetic path length lc. An additional dimension, that's not required to determination the magnetic properties, but is necessary for the calculation of the actual inductor or transformer, is the cross-sectional coiling area Aw. The core-area as well as the coiling area can easily been measured with a vernier gauge. The magnetic length will have to be estimated. This is the average path that the magnetic field follows, roughly though the center of the core. Fig. 2: Two versions of an E-core with an air-gap. In figure 2 are two options shown how an air-gap can be created in an E-core. On the left side a standard E-core where are spacers sheets being used to create the air-gap. 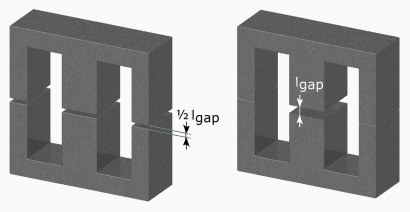 In this case the air-gap lgap is equal to twice the spacer thickness. Because a complete loop of the magnetic field lines must cross twice the separations between the core halves. On the right side a core where the air-gap is created by special core halves with a shortened middle leg. The outer legs of the core halves lie against each other without spacing. The field lines cross now only ones the air-gap, so the length of separation is equal to the length of the air-gap lgap. It's very difficult to determine the area of the air-gap Agap. The field lines in the air-gap are not completely homogeneous. The area will get bigger as the length of the air-gap is increased. If the ratio between the air-gap length and the width of the legs is very small, then it's safe to set the air-gap area equal to the core area Ac. American manufacturers are still using the CGS units. The most important magnetism units with their conversion factor to SI units (Dutch) are listed in the table below. The CGS system of units doesn't know a physical constant for permeability. The CGS permeability is equal to the relative permeability within the SI-system.